A few students of Ramjas College decided to hold a meeting in protest of the recent raid and arrest of five human rights activists and intellectuals by the Maharashtra police on 30th August in the basketball court of the college at 12 p.m. However, the protest was cancelled at the last moment by the college administration due to the alleged “fear of violence” in the campus. DU Beat spoke to teachers, students, and other people involved in the incident. Read on to know the full details. Support for the event was generated by a few students from Ramjas College through social media, especially Facebook posts. 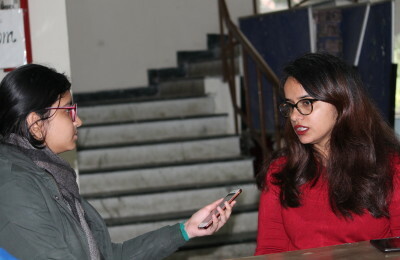 Dhatri, a second-year student of Political Science at Ramjas, who spearheaded the event, said, “We have seen how human rights intellectuals, activists, and various other people who were highly qualified were arrested on the false grounds that they had Maoist links, which is completely bizarre. So we were outraged as students and we decided to have a discussion on it? It would only be productive as more people would be informed about what’s happening all over the country and how voices of dissent are being suppressed by the government.” She also alleged that the posters the students had put up about the event were taken down. “Suddenly in half an hour, we see that they have been taken off. In front of the staff room, the posters were taken off in a span of five minutes,” Dhatri added. DU Beat talked to the security guards, who were ushering the students away from the basketball court. The guard on duty said that the Principal had issued a notice against the gathering of more than four people, in fear of the “threat of violence” because of a rally that started by the Akhil Bharatiya Vidyarthi Parishad (ABVP) around the same time in front of Ramjas College. On being pressed for more information, the security guard refused to allow even one person on the basketball court and ushered the students away. The students then assembled in Room 315 of the college and held a meeting, deciding that they would then submit a petition to the Principal seeking permission to hold an interactive session again. Dhatri also alleged that a person from the Special Branch of the Delhi Police had called her and asked her to keep her updated in case of any meeting they organise. “If I want to have a meeting with my friends in the college or with my professors, why am I supposed to inform the Delhi Police? Why would the police be informed by the Principal of a college about an interactive session with the students? Why would the ABVP start a rally at the same time at the same place?” Dhatri also alleged that the Principal had also put a stop to even small gatherings in the classroom until the elections, without prior approval. The ABVP had meanwhile arranged a rally at the Faculty of Arts at 11 p.m., campaigning for which, according to its volunteers, had started a month before. Various pre-election candidates started their own individual rallies around points like Ramjas College, Kirori Mal College, School of Open Learning, etc. They all congregated at the Arts Faculty. According to an official poster, the rally was supposed to focus on various issues related to concerns of students such as the construction of new hostels and colleges, installation of sanitary pad vending machines in all University of Delhi colleges and so on. While inside the campus, the security guards of Ramjas College closed down its gates, not allowing anyone to enter or leave the campus, claiming that they have orders from above. Sudhir Dedha, an alumnus of Ramjas College, was the ABVP potential candidate who started his rally at the Ramjas College gate and marched towards the Arts Faculty. The issue of “Urban Naxalism” has gripped the recent discourse in media. Shri Niwas, National Joint Organising Secretary of the ABVP, threw up allegations in the rally at the Arts Faculty that the professors of Delhi University were slowly propagating Urban Naxalism. He specifically mentioned colleges like Ramjas, Kirori Mal, and Hindu College as being hubs of such ideology. “We see that there is an issue on campus about Urban Naxalism. So, we need to make students aware of these because these are Urban Naxalites,” Mr. Khatana said when asked about Shri Niwas’s comments. “There are certain professors who are spreading Urban Naxalism in campus. For now, we cannot say who these people are. In time, they will show their colours. Not just these three colleges, there must be other colleges too,” he added referring to the arrest and conviction of Professor G.N. Saibaba and the 2017 Ramjas incident wherein slogans for the independence of Bastar (in Chattisgarh) were allegedly raised. Meanwhile, the students of Ramjas plan to continue with their meeting on 1st September, Saturday after their petition to hold a meeting was denied by the Principal to avoid “disruptions by college election groups”, as Dhatri claimed.